The birthplace of Boccaccio, Machiavelli, and the powerful Medici family, Florence was also the first great banking and commercial centre of continental Europe. The city's middle-class merchants, though lacking the literary virtuosity of its most famous sons, were no less prolific as writers of account books, memoirs, and diaries. Written by ordinary men, these first-hand accounts of commercial life recorded the everyday realities of their businesses, families, and personal lives alongside the high drama of shipwrecks, plagues, and political conspiracies. Published in Italian in 1986, Vittore Branca's collection of these accounts established the importance of the genre to the study of Italian society and culture. This new English translation of Merchant Writers includes all the texts from the original Italian edition in their entirety. 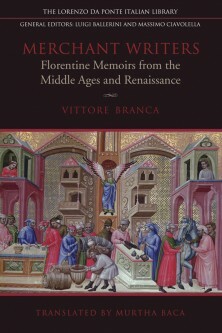 Moreover, it offers a gripping personal introduction to the mercantile world of medieval and Renaissance Florence.